Your iPad can do lots of things, but live TV generally isn’t one of them. With a few exceptions, the TV networks don’t want their programming going out live anywhere but your big screen, under their supervision. Here’s a start-up that wants to change that: Bamboom says it will let you watch live broadcast TV anywhere you can get a Web connection, on whatever device you want. We’ve seen versions of this before. FilmOn and Ivi both offered something similar last year, and both tried to argue that they had the same right to distribute broadcast TV signals that cable companies did. And both have been slapped down by the courts. But Bamboom has a Rube Goldberg-like approach that might hold up to the inevitable legal challenge: The company will assign a tiny broadcast antenna to each customer, and will move the TV signal from the antenna to the cloud, where it can move it to any device with a browser. One customer, one stream. The company hasn’t discussed pricing yet, but BTIG analyst Rich Greenfield (registration required) thinks it may try a freemium model, where the company offers the broadcast stream for free but charges for a DVR option. So what does that mean if this works? 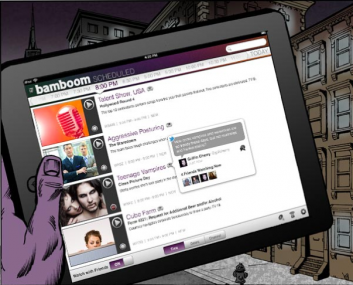 For Bamboom’s users, depending on the cost, the service could be a nice way to catch live sports and programs like “American Idol” on the go. Nice to have, but not crucial. But as Greenfield points out, if Bamboom takes off, it could cause big problems for the established TV business. That’s in part because the service could encourage cord-cutting, though I think that risk is rather minimal–Bamboom’s system can only deliver broadcast TV signals, so dropping your cable subscription still means you won’t be able watch anything on cable TV. The bigger issue is that over the past few years broadcasters like CBS have been able to get cable providers like Comcast to shell out a lot of money for the right to carry their programming. But if Bamboom is doing the same thing without paying a penny, that’s going to destroy their leverage. Which is why the start-up, which has raised $4.5 million from FirstMark Capital, First Round and others, says they’re saving much of that money for legal fees.